Sometimes when the world seems full of testosterone, belligerence and people cheerfully murdering each other, it’s good to get mad about something really petty. Thank you, red awnings. Yup – agree with you. Anything to add to the ugly streetscape anyway! If these awnings are out, I wonder what the council is actually planning for? Here here!! 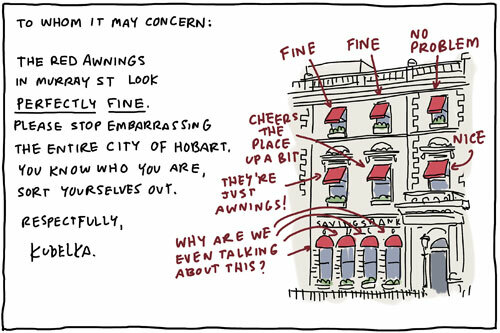 Talking about awnings is worse than talking about the weather, the lights at Bellerive or Agfest…beats the Royal Wedding though I suppose. …but, but, but they’re RED. Think of the potential dangers – 1)mild-mannered Hobartians may spy the colour of passion and be suddenly inflamed with lust; 2)passing bulls may become enraged, turning lower Murray St into a mini-Pamplona; or 3)sneaky Communists (is there any other kind?) may infiltrate, using the awnings for camouflage. Vivienne, your comment made my day. I love the awnings! Great cartoon! !